Greencore boss Patrick Coveney is battling to keep his job after a shock profit warning and growing investor concerns about his running of the group. Last Tuesday, Greencore stunned the market when it revealed that continuing problems in its US business would mean that earnings per share for the year to the end of September 2017 could be as low as 14.7p (Greencore reports in sterling) as against the 15.7p-16.6p previously being forecast by analysts. Greencore is closing its Rhode Island facility, the head of Greencore US Chris Kirke is leaving the group and Coveney will "take a direct role in the strategic, organisational and operational leadership of Greencore US", spending half of his time in the US. The shake-up at Greencore US will also probably result in an as yet unspecified asset write-down. "We may take a non-cash impairment charge. This will be determined by the prospective future use of these network assets," says Coveney. The market reaction to the profit warning and the prospect of a major write-down was savage. The Greencore share price, which had been trading at 182p before the announcement, dropped to just 127p following the publication of the bad news, a fall of 30pc. Following last week's steep fall, the Greencore share price is now down by more than 50pc over the past 12 months. Such a sharp fall reflects growing investor unease at Greencore's performance and has inevitably raised questions about Coveney's future leadership of the group. "We have not had many investors calling for management's head. There is a lot of dissatisfaction. This is the last-chance saloon. You only get so many chances," said Peel Hunt analyst Charles Hall. Coveney, a brother of Tanaiste and Foreign Affairs Minister Simon, bet the farm with the $747m (€606m) acquisition of US company Peacock Foods in November 2016. The acquisition was largely paid for by a deeply-discounted nine-for-13 rights issue that raised a gross £431m from shareholders. Immediately prior to the announcement of the Peacock acquisition, the Greencore share price had been trading at 292p, valuing the group at £1.19bn. After last week's announcement, Greencore's market capitalisation fell to just £912m. Based on those numbers, far from creating shareholder value, Coveney's acquisition of Peacock has resulted in the massive destruction of shareholder value. Does this mean that Greencore bought a lemon in Peacock and that we are witnessing yet another Irish food and drink company come a cropper with a Stateside acquisition? Not necessarily. While Greencore certainly has more than its fair share of problems in the US, these seem to be concentrated in its existing businesses rather than in Peacock. "Peacock has proved to be a good business. It has delivered to plan. It is Greencore's existing US businesses that are a lemon," said Hall. "Greencore's legacy US business has been challenging for a number of years," wrote Goodbody analyst Jason Molins. "Capacity utilisation at Rhode Island (c20-25pc) was unsustainably low." Coveney has said: "Peacock greatly enhances the scale, operational capacity, financial performance and growth prospects of our US business." In a note published immediately after the profit warning, Molins left his 2018 revenue forecast for Peacock unchanged at £838m but slashed his revenue forecast for the Greencore US legacy businesses from £217m to just £198m. Although Molins has pencilled in a 14pc decrease in his forecast for Peacock's 2018 operating (pre-interest) profits to £45.5m the situation is much worse at the legacy businesses where he now predicts an operating loss of £4.9m as against his previous forecast of a £700,000 profit. Greencore's businesses on this side of the Atlantic - mainly in the UK, where it is the largest sandwich manufacturer - seem to be bearing up much better. Molins has left his 2018 and 2019 revenue forecasts for Greencore's British and Irish businesses largely unchanged at just over £1.4bn for both years while he is predicting operating profits of £111m this year and £119m in 2019. Greencore is also on track to achieve its target of reducing net to two times ebitda (earnings before interest, taxation, depreciation, and amortisation) by the end of the current financial year, according to Coveney. If achieved, this would leave Greencore with net borrowings of approximately £420m by the end of this financial year. Molins reckons that year-end net debt will be somewhat higher, about £486m, falling to £429m by the end of 2019. Following last Tuesday's announcement, Molins is now predicting Greencore operating profits of £154m in 2018 and £164m in 2019. Greencore now bears absolutely no resemblance to the former state-owned Irish Sugar Company that was privatised in 1991. It exited sugar manufacturing in 2006 and is now a convenience food manufacturer. It produced over 1.5 billion sandwiches, 388 million lunch kits, 301 million salad kits, 143 million ready meals and 137 million jars of cooking sauces in 2017. Although most of us have probably eaten one of its sandwiches, ready meals or sauces at one stage or another, it is one of those companies of which most consumers are blissfully unaware. This is because it doesn't sell directly to consumers but to supermarkets, forecourt retailers and fast food chains instead. These contracts are typically for large volumes on tight margins. Molins' new forecasts would see Greencore earn an 8pc operating margin in the UK this year and just 3.9pc in the United States. On those sort of margins, there is zero room for error with either a lost or delayed contract having the potential to wreak havoc with the bottom line. Delays in getting some hoped-for new contracts over the line contributed to last week's woes. The key to maintaining and growing profitability at Greencore is to maximise the utilisation of its facilities. Coveney said: "We have already flagged the need for greater utilisation of our existing US sites. Jacksonville and Minneapolis have had utilisation challenges. We are stepping up utilisation. Our plans are well advanced. We have secured significant new business across several sites. This will flow through in the 2019 financial year." 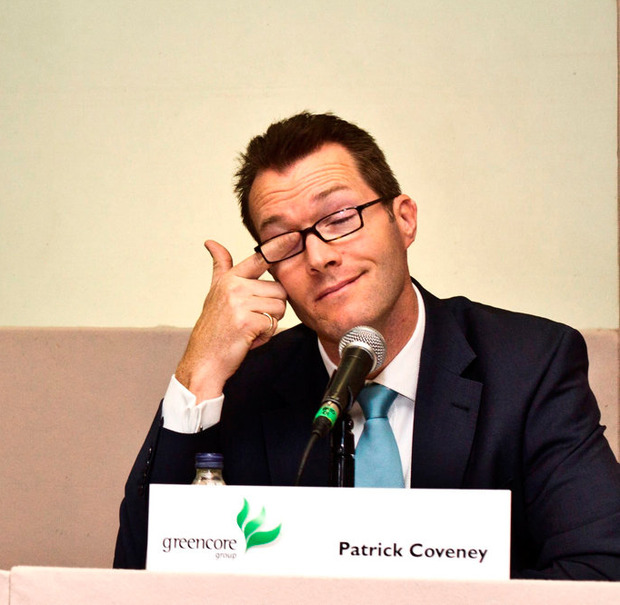 While Greencore seems to have avoided the US acquisition jinx with Peacock, its most recent problems in America are merely the latest hiccup in Coveney's decade-long leadership of the group. When Coveney took over as Greencore boss just over 10 years ago, the Greencore share price stood at 436 cent (then worth £3.33) valuing the entire company at €871m (£666m) - Greencore quit the Irish Stock Exchange in 2012 and its shares are now traded exclusively on the London Stock Exchange. Over the same period, the number of Greencore shares has more than trebled from 200m to just over 700m, largely the result of two major rights issues in 2011 and 2016. This huge increase in the number of Greencore shares matters. In fact it matters a lot, as it means that any profits attributable to individual shareholders (earnings per share) have to be sliced far more thinly. What this means is that someone who spent £10,000 buying Greencore shares when Coveney first became boss 10 years ago and didn't take up their rights in either 2011 or 2016 now has an investment worth just £3,903, a fall of almost 61pc. If Coveney, who before becoming chief executive was Greencore finance director for almost three years, does walk the plank, it will be this long-term erosion of shareholder value rather than any short-term problems at Greencore US that could well prove to be decisive.